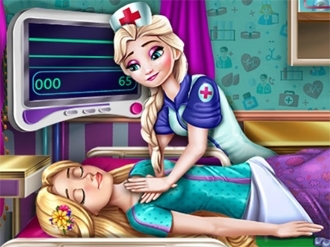 Pregnant Rapunzel needs your help in a new and fun doctor game! She has to recover from an accident so hop on a beautiful and interesting journey and let's make Rapunzel feel better. Use the tools to get rid of the wounds and heal the fractures using the x-ray machine. After you've taken care of her, Rapunzel and the baby will be all well and healthy again. Cinderella needs a good doctor right away. She is pregnant and she injured herself because she felt down the stairs. Make some tests to see how the baby feels and heal her injuries. Use the tools in the right order and help Cinderella and her baby recover. Enjoy!